Night Snapper Fishing Charters are a great way to get out of the heat in the summer and fill the coolers with great eating snapper. Mainly mangrove snapper is targeted June, July, and August, but the rest of the year we can fish for yellowtail and mutton snapper. 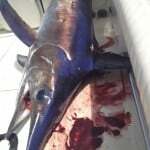 This type of reef fishing is very similar to the daytime reef trip. The main difference is that we can use heavier leader and sometimes I will add weight to get the bait to the bottom. I use bigger baits at night especially during the mangrove snapper spawn. This fishing is time oriented and times may reflect with the moon phase. Sometimes during certain moon phases the fish won’t bite till 11:00-12:00 at night and I will adjust the times for the trip according to the bite. This will ensure that you don’t fish for four hours and the last hour of the trip the fish finally bite. I like to try and make every trip the best I can, and sometimes when we fish spawns the times can change. I will fish with jigs and bare hooks, some weighted and some not. As fishing changes I change the terminal tackle to maintain a good bite. I have plenty of lights on the boat and under the water to see everything. If you never have been fishing at night it is a must do especially in the summer when its 90 degrees out. 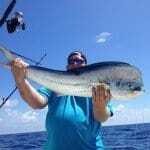 During the cooler months kingfish fishing is incredible and they are great fighters. When fishing for kingfish at nigh I either use a single treble hook with live bait or the old school triple long shank hook rig with whole ballyhoo or pilchards. If the current is light I will forgo the weight but if there is current I can use as much as 2 ounces depending on current and conditions. I like to feed the bait out a long way and then just let it sit; the kingfish will find the bait using their nose picking up the oil and blood in the water. Night trips are usually four hours but I can customize any trip for you as long as it does not impede a trip already on the books.